First made in 1884, this Victorian Toilet Roll Holder was made by the Sanitary Paper Company, later appearing in The Ironmonger periodical of that year it was reported to be the first holder able to use un-perforated toilet paper. Faithfully copied from the original, this Victorian Toilet Roll Holder is cast in brass, available in a choice of aged brass or aged nickel plated brass finishes. The Toilet Roll Holder has been updated with a spring loaded spindle. 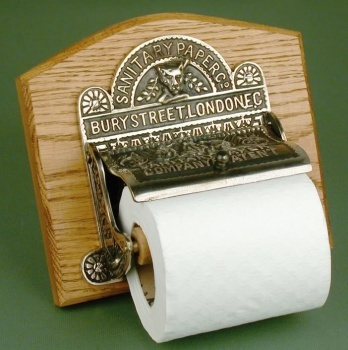 Mounted on an seasoned oak back plate which perfectly sets off the detail of the casting, this can be directly mounted to your wall and is suitable for use with toilet rolls from all major suppliers.